Nar Phu Valley Trek lies in the most remote of the Manang District and access is granted only with the purchase of a special permit. This area consists of two main villages - Nar with 300 permanent residents called Nar-ten and Phu with 200 permanent residents called Phu-ten. These remote villages are situated above tree line and completely cut off during the snowy winter months. Residents of these valleys make their livelihood mainly from herding yak and trading meat, wool and hides with the villages located in the lower regions of Manang. On this trek, Settled around the 10th Century by Tibetan herders and traders migrating south from Tibet, the inhabitants of Phu (also noted on maps as Phoo) once placed high value on their remote and strategic location. Tall stone lookout towers, now standing in ruins, where used to spot possible invaders coming from all directions and thick wooden doors where bolted shut at night locking the residents securely inside. We can have the entire day to explore this fascinating area. We can have the great pleasure of sightseeing inside the Tashi Lakhang Monastery, which sites high above the village. Tashi Lakhang - 'the blessed house of gods' is one of the oldest monasteries (or Gompas) in Manang. The Gompa is one of 108 constructed by Lama Urgen Lhundup Gyatso and, along with the monastery in Braga, makes up the heart of spiritual life in the Manang District. It takes two days to reach Naar from Phu Village, the principal and seemingly more prosperous village in these remote valleys. Naar, situated at 13,730 feet, is also called Chuprong meaning 'the place of Blue Sheep'. The original inhabitants of this valley are believed to be from Tibet's ancient Shang Sung Kingdom arriving sometime in the 8th Century and converted from Bon to Buddhism after the birth of Buddha in Lumbini. Nar Village sits above a large flat plain which make up the extensive agriculture fields being plowed by teams of humans and their yak. It seemed as though the entire village population are in the fields turning the soil and planting seeds in anticipation for the summer rains. As in Phu, wandering around the village and observing local life untainted by the outside world is fascinating. 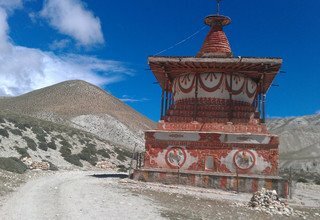 Mustang Circuit Trek is one of the most popular trekking destinations for the traveler who would like to explore ancient monasteries and caves in a remote area and a beautiful landscape. This is the forbidden kingdom and ancient wall city of Mustang and it is open for trekkers since 1992. This trek is very enjoyable due to its isolation and beautiful landscape. Mustang is a land where the soul of the man is still considered to be as real as the feet he walks on; a land said to be ‘barren as a dead deer” but where beauty and happiness about in spite of hardships. Mustang is an ancient Himalayan Kingdom which lies in the northern central part of Nepal and at the top of the Kaligandaki River. Upper Mustang consists of two distinct regions: the southern part and the northern where the languages, culture and traditions are alike to those of the Tibetan people. This area is consider as one of the most interesting and picturesque places in Nepal. The whole area has an isolated and mystical feel to it, enchanting and inspiring visitors to this region. One of the few regions which could escape foreigners was Mustang, a Buddhist kingdom in the Himalayas. Only a handful of Westerners had visited the area in western Nepal before it was opened to tourism in 1992. They brought back reports of a culturally highly developed, thriving medieval society and a landscape almost beyond description. It lies north of the two 8'000 meter peaks Annapurna and Dhaulagiri. The arid place with snow-capped mountains and barren hills reaches deep inside the vast Tibetan plateau. Cold winds sweep through narrow canyons and over plains. Erosion has left its marks in bizarre rock formations. Yet humans have lived in this hostile environment for centuries. They have built their settlements along rivers and creeks, the villages of whitewashed houses appear like oases in a huge desert. People work as farmers on their fields, sowing and harvesting barley and potatoes, and driving cattle to relatively fertile meadows. High up in vertical cliffs are inaccessible caves where people dwelled two thousand years ago. Much later the region came under the influence of the Tibetan Yarlung dynasty. In the 15th century the independent kingdom of Lo was founded by Amepal, whose invitation of the famous Buddhist scholar Ngorchen Künga Zangpo led to a cultural zenith never to be reached again in the following centuries. It was probably thanks to its remoteness that even in later times of conquest Mustang was granted large autonomy. The destruction of their culture and religion could be averted but the Hindu culture and tourism are definitely a threat these days. Only in 1950 was it officially declared part of Nepal. The years following the Chinese invasion of Tibet proved to be the most difficult ones in Mustang’s history. Large numbers of Tibetan freedom fighters set up their camps and attacked the nearby Chinese troops, putting Nepal in a delicate situation. In the 1970 the Dalai Lama asked the guerillas to stop their fighting, the Nepalese government arrested and sentenced some of the leaders. It takes some effort to discover the scenic and cultural beauties and mysteries of such an area. Our plan is to follow the Kali Gandaki from Jomsom northwards for two days, then taking the west route to the capital Lo Manthang and from there back to Jomsom over the holy site Muktinath. After breakfast in the hotel, Drive to Swayambhunath Stupa which is very close form the centre of Kathmandu. It takes some minutes to be there. This Temple is also known as Monkey Temple which is considered to be self made Stupa. Then visit to Boudhanath Stupa: the biggest stupa in Nepal and one of the bigger stupa in the world. You can basically experience Tibetan Buddhism, culture and way of life in Boudhanath Area. Boudhanath area is the authentic place to buy Tibetan stuffs. Again you will be visit Pashupatinath Temple and it is one of the most sacred temples in the entire Hindu world. It is a sacred place where Hindus come to die and to be cremated. The temple of Pashupatinath is a large double roofed, gilt pagoda, decorated with brass, the gateway is plated with silver. There are images of Shiva along with other statues, shrines and temples dedicated to other deities in the complex. A circuit of the Pashupati area takes visitors past a sixth-century statue of the Buddha, an eight-century statue of Brahma the creator and numerous other temples. There are rows of Shiva shrines and Hindu pilgrims from all over south Asia offering ceremonies to worship Shiva, the Lord of Destruction. Stay overnight at Hotel in Kathmandu. In the morning, drive from Kathmandu to Bhulbhule by private land cruiser passing the Trisuli and Marsyangdi River. You can see three snow peaks, Lamjung Himal, Peak 29 and Manaslu during the driving. Overnight in Lodge. You start your trek in the morning after breakfast, the trail goes gradually uphill to Chamje and you cross another suspension bridge and follow the steep rocky trail until reaching Tal village which takes 3 and half hours. You can see again very beautiful waterfalls in Tal. You have lunch break here. Then you continue again on a rocky trail to Kotro, which takes about 2 hours. You continue straight and cross the suspension bridge near Lower Dharapani. You continue a little more climbing and arrive in Higher Dharapani. Overnight in Lodge. You begin your trek in the morning towards Bagarchhap which takes about 1 hour passing through pine and fir forests. You can visit the white washed monastery in this village. Then you continue your trek till Danaque it takes about 1 hour. The trail is ascending steeply until Timang which takes about 1 and half hour. You have a good view of Mt. Manaslu and Peak 29. Now your trail continues through pine forests again till Latamarang which takes about 1 and half hour. You have lunch break here. After lunch, you walk again through forests and you have a short glimpse of Annapurna II. Finally you arrive in Koto village after 1 and half hours walk. Overnight in Lodge. In the morning, you register your restricted area permit at the Police check post. Then you start your trek through the River bank of Suti Khola again through wonderful pine forests passing many streams and suspension bridges until reaching Dharmasala which takes about 5 hours. You can see a picturesque Waterfall near the Dharmasala. You have your packed lunch on the way. Then you continue your trek again through forests and ascend steeply till Meta Village, which takes about 1 and half hour. Now you have arrived on the Tibetan Plateau. You have very good view of Annapurna II and Lamjung Himal. Overnight in Lodge. Today, you start with up and down as well as on traversing suspension bridges over diffrent streams. Again packed lunch at Kyang which takes about 4 hours. Actually you do not find any houses and lodges in this area. You just see the remnants, particularly the ruined forts of the Khampa settlement (the place which Khampa refugees from Tibet once captured and lived illegally) at places like Jhunam, Chyakhu and Kyang. Then you keep walking passing the Phu Khola on a rocky trail until Phu village which takes about 3 hours. You can see Blue Sheep during the trail. Now you are in one of the unique Lost/ Hidden Valleys. You can see their cultures, natural diversity, and religion of the ethnic groups like Lama, Gurung and Ghale. The people are depending on subsistence agricultures, animal breeding and seasonal migrations. The very old Buddhist Monastery known as Tashi Lakhang Monastery is listed out of the 108 world’s great Buddhist Monasteries; it is believed to be the last monastery constructed by Karmapa Rinpoche. You have a great view of Himlung Himal and other snow peaks. Overnight in Lodge. Today, the trail descends, passing many streams and suspension bridges until Mahendra Pul which takes about 4 hours. You pass the high suspension bridge 80m over the Gorge of Lapche River. You have lunch in Mahendra Pul. After lunch, the trail steeply ascends passing many Buddhist stupas until Naar Village which takes about 2 hours. You find here many Buddhist Monasteries to visit as well as a very good view of Pisang Peak and other small peaks. Overnight in Lodge. Today morning you will start your trek early in the morning and until to Jhombu Kharka also known as Kang-La Phedi. It takes 3 hours. You can see Yak herder’s camp with many Yaks. The trail steeply ascends passing different landslide areas to Kang-La Pass which takes about 2 and half hour. Now you have a superb view of the Annapurna Range and other peaks. Then you descend steeply till Ngawal village which takes about 3 hours. Overnight in Lodge. Today your trail is slightly descending until reaching Braga village. Visit the monastery. It takes 2 and half hour. Then 30 minutes walk from Braga to Manang. This is the right option for a great view of the Annapurna Range. Afternoon, hike to Chunker view point - Gangapurna Lake & Cave Gompa. You can hike to Chhunker view point which takes about 1 and half hour. You can see the Gangapurna Lake as well, as the Annapurna range like Annapurna I, II, III, IV, Tilicho peak, Pisang peak, Chulo peak, Thorong peak and so on. Then you return back to your lodge and have lunch there. 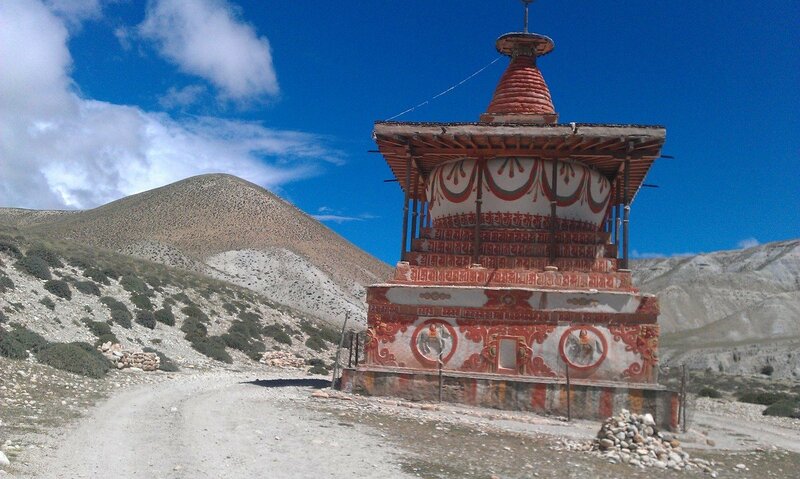 After lunch you hike with your guide to the Cave Gompa which is situated at the elevation of about 4500m. It takes 2 hours to reach there. This is also a very good place to have magnificent view of Annapurna Range. Then you return back to your lodge. Overnight in Lodge. You begin your trekking until to reach Yak Kharka which takes about 4 hours. You rejoin the classic trail now. You have lunch break here. You can do short acclimatization in afternoon. Overnight in Lodge. The trail ascends to reach Letder which takes about 1 hour. Then you continue the trail until Kaligandaki River and cross the Wooden Bridge. It takes about 2 hours. The steep short climb up and difficult landslide trail brings you to Thorong Phedi after 1 and half hour walk. You have lunch here. Overnight in Lodge. Today is better to leave early in the morning. The steep trail ascent brings you to Thorong High Camp which takes about 1 hour. Then the trail is gradually ascending until to reach Thorong-La Pass which takes about 3 hours. Then you can enjoy with taking pictures of you in the highest elevation, then better to descend as soon as possible. You continue to descend till to Chabarbu which takes about 3 hours. You find few lodges to have lunch. Then after lunch, you continue until to reach Muktinath village. Overnight in Lodge. Early in the morning, you hike to secret place for Hindus and Tibetan Buddhist in about 30 minutes in its compound. You can see the 108 spouts, Muktinath temple stands enshrining Vishnu, a Hindu god. Below the temple there is another Buddhist monastery where the combination of earth-water-fire that gives for Muktinath’s great religious significance. And you also see the magnificent view of Nilgiri Himal and Daulagiri I. Overnight in Lodge. Then you have breakfast and start from Muktinath to Jharkot which takes about 1 hour. You visit the old monastery and continue your trek until to reach Kagbeni which takes 2 hours. You have lunch here. Overnight in Lodge. In the morning after breakfast, we must register our Restricted Area Permit in check post which is situated at the end of the village. Then the route continue passing the river bank of Kaligandaki. Repeating small ascents and descents until Tangbe village which takes about a 3 hours walk. We can see beautiful landscapes and the Buddhist influence like Chhörtens , Maniwalls. Then we continue our trek for 1 hour to Chhusang village passing over a rocky trail. We have our lunch break in this village. After lunch, we again continue on our route by the river bank and we cross over an iron bridge where the Kaligandaki River runs through a tunnel naturally built in a huge rock. It takes about 1 hour. Later we can see 16 caves above the tunnel. We walk up a steep ascent untill we reach the village of Tsaile which takes about 30 minutes. We have a good view of Nilgiri Himal and the Kaligandaki River. Overnight in Lodge. In the morning, we climb up an unstable path and arrive at a plateau. We keep ascending the gentle slope and later we climb steep cliff way and arrive at a small pass.We keep gently descending to Samar village. It takes about 2 and half hours. We have lunch break here. After lunch, we leave the village and keep on going up and down until we reach the Chungsi cave monastery. It is an incredible place and we enjoy the strong spiritual environement . It is a steep ascent about 1 and half hours . We visit the monastery where Guru Padmasambhava meditated in 8th century. Then we continue our trek passing narrow way between two big huge rocks. It takes 1 and half hour to reach Syangmochen village. Again we climb up until we reach a small pass. After a you gentle descend we reach the village of Ghiling. We see a big Chhörten and two Gompas whose walls are notably painted in red. Overnight in Lodge. In the morning, after breakfast, we visit the monastery. Then we keep on walking ascending gently until we reach Zaite village which takes about 1 hour. After the village a long ascent awaits us to Nyi-La 4020m. We cross over this pass entering the center of Mustang which is called the Lo region. Then we keep gently descending to reach a small pass again. After that pass it really goes steep down in a zigzag way to Ghami village. It takes 2 and half hours. We have lunchbreak. After lunch we walk again through Nepali flat which means down and up and finally crossing the small Khola. We can now see the longest Mani Wall in the Mustang region which is painted with vertical stripes of white, red and black. Then we have again a long steep ascent to a small pass and descend gently to Tsarang village. It takes about 3 hours. We can see a big huge Chhörten in the entrance of village, an Old Palace and Tsarang Gompa which we willvisit in the evening. Overnight in Lodge. We follow the upper trail which allows us to explore the Lo-Gyakar-Ghar Gompa. First we follow the river side trail to Marang village. It takes about 1 hour. Then we cross the River on a suspension bridge and continue to Ghar Gompa which takes about another 1 and half hours. Where we visit the Gompa. It is one of the oldest Gompas of upper Mustang. It was built by Guru Padmasambhava, the founder of Tibetan Buddhism in the 8th century. After visiting the monastery, we continue our trek crossing the small river and keep walking on the plateau and where we have at some point our packed lunch. After lunch, a long gentle ascent continues to reach Chogo-La 4230m which is the highest point in this region. Then we keep descending to Lo-Manthang which takes about 4 hours. Now we are in the ancient wall city of Mustang. Overnight in Lodge. Day 19; Side Trip to Chhoser Village for several monasteries and 100 caves inside the cliff and back to hotel. We start our trek after breakfast, leave the village and keep by gently ascending going until we reach Day-La which takes about 1 hour. This is the last point where we can see Lo-Manthang. After 3 hours we reach Dhi village then we descend for about 1 hour down where we have lunch break. After lunch we pass the small Khola and make a short steep climb to Yara village. It takes about 1 and half hour. We can see innumerable caves at the stonewalls. Overnight in Lodge, Home Stay. Today is a difficult and long day for us. Therefore we start really early in the morning. We first have short and steep ascent and then long flat way for about 1 hour. Then the trail continues steep down to Dechhyang Khola which origin is from Damodar kunda. It takes about 30 minutes.We find everywhere Saligrames (the black fossils of marine animals). Then the trail steeply ascents and leads us to the top of the pass which takes about 2 and half hour. Then another climb for about 30 minutes where we have our packed lunch break. After lunch, the trail goes up and down for about 1and half hour. Then we are on a huge plateau and cross it for reaching the to Tangya village.We can see several big Chhörtens. Overnight in Lodge/Home Stay. Today is also long day again. Therefore we start again really early in the morning. We leave the village, cross the suspension bridge and follow the short river route. After crossing the river, we steeply climb up to reach a small pass it takes about 3 hours. Then the trail goes straight to Pha (shelter house) where we have our packed lunch. After the break we continue crossing many small passes until we reach the top of the hill. It takes about 2 hours. Then the trail steeply descends and we encounter strong winds until we reach Chhusang village.We have a superb view of Nilgiri Himal, Dhaulagiri I, Tukuche Peak, and other snow peaks. Overnight in Lodge. We will walk to Old Jomsom village and continue through the large Thakali village of Thini which takes about 1 hour. Again we will continue our trek to Dhumpha Lake and Katsapterenga Gompa. We will visit this monastery and continue our trek to Syang cross by suspension bridge over the Kaligandaki River which takes about 2 hours. Then we will keep walking until reaching Marpha village which is also known as capital city of Apple. It takes about 30 minutes. We will have lunch there and visit the ancient monastery of that village. Then walk back to Jomsom. Stay overnight in Lodge. Day 26; Jomsom to Pokhara by flight and afternoon flight back to Kathmandu. Early in the morning, we fly back to Pokhara and transfer to our Hotel. Afternoon fly from Pokhara to Kathmandu and transfer to hotel. Day 27; Transfer to international airport after breakfast or according to Your flight time. All inclusive Trek Cost for single person: USD 4715 as a single trekker. * 3 nights deluxe accommodation with breakfast at 3***hotel in Kathmandu and Pokhara. * All transportation by private car and 4W drive. * Naar-Phu Valley Restricted Area Permit. * Domestic flight ticket from Jomsom-Pokhara-Kathmandu and airport tax.